A protest broke out surrounding the dominance of Documenta, a prominent art exhibition that takes place every five years in Kassel, Germany. Adam Szymczyk has been selected to be the artistic director of the Documenta 14 exhibit, and an ever-growing group of artists is protesting in refusal of recognizing the legitimacy of any institution that is large and dominant in the way Documenta is. I have interviewed representatives of the protestors in German and translated the interview to English. For more information about the protest and a list of participants, visit the WIR WOLLEN NICHT ZUR DOCUMENTA 14 website. Wie viele Menschen sind in ihrer Gruppe? Wir sind keine feste Gruppe, sondern eher eine Zusammenrottung, eine Koalition der Unwilligen. Zu einem festen leuchtenden Kern von Künstlern, die sich persönlich kennen, sind andere Künstler hinzugekommen. Sie sind angeflogen gekommen wie Motten zum Licht. Und es werden immer mehr werden, da geteilt wird, was wir finden. Einer unterschreibt, dass er gegen die Documenta ist, ein anderer findet das ebenfalls und will auch dagegen sein. Am Ende sind alle dagegen und keiner mehr dafür. Das ist das Ziel. We are not a fixed group but, rather, a rioting assembly, a coalition of the unwilling. Many artists have joined our solid, luminous core of artists who are personally acquainted. They fly to us like moths to a light. And there will be forever more artists who will share what we find. Once one signs on that he is against Documenta, another will find that he is likewise against it. In the end, everyone is against it, and there are no more in favor. That is the goal. Warum protestieren Sie gegen die Documenta 14? Why do you protest against Documenta 14? Wir protestieren natürlich nicht im gewöhnlichen Sinne, denn Kunst und Protest sind wie Feuer und Wasser. Aber wir haben eindeutig etwas gegen Dinosaurier! Und die Documenta ist so ein Saurier. Der größte Dinosauerier von allen. Und alle fahren zur Documenta hin als würden sie eine Zeitreise machen, um die Welt der Dinosaurier zu bestaunen. Sicher sind da gute Kunsterlebnisse dabei und es gibt einen Erkenntnisgewinn. Aber um genau so einen Erkenntnisgewinn geht es uns auch. Wir hüpfen einfach als HomoSapiens durch die Dino-Kulisse mit einem gelben Schild, auf dem steht: Wir haben eine Theorie über euer Aussterben! Wir müssen einfach dagegen sein, denn Aufgabe von Künstlern ist es, gegen alles zu sein, was zu groß ist! We, of course, do not protest in the ordinary sense because art and protest are like fire and water. But we definitively have something against the dinosaurs! And Documenta is one of the dinosaurs, the biggest dinosaur of them all. And everyone goes to Documenta as if they are going back in time to marvel at the world of dinosaurs. Certainly, there are good art experiences there, and it is a learning experience. But we are also creating a learning experience. We simply skip as homosapiense through the dinosaur world with a yellow sign that says, “We have a theory about your extinction!” We must be against it because one task of the artist is to be against everything that is too big! Wie denken Sie über Adam Szymczyk? What do you think about Adam Szymczyk? Zugegeben, Adam tat uns anfangs leid. Er hat da dieses riesige berühmte Tier an der Leine und alle wollen mit ihm sprechen und ihn zu irgendwas überreden. Alle wollen einmal in ihrem Leben für 100 Tage auf den Rücken des Dinos klettern. Was für ein Stress! Da haben wir zunächst eigentlich nur gedacht, wir entlasten den Adam und sagen ihm gleich von vorn herein dass wir nicht wollen. Dass er nicht mit uns rechnen braucht. Sie sehen, es hat eigentlich sehr harmlos begonnen, so kampfeslustig waren wir erst gar nicht. Aber es hat sich alles hochgeschaukelt, was soll man machen. 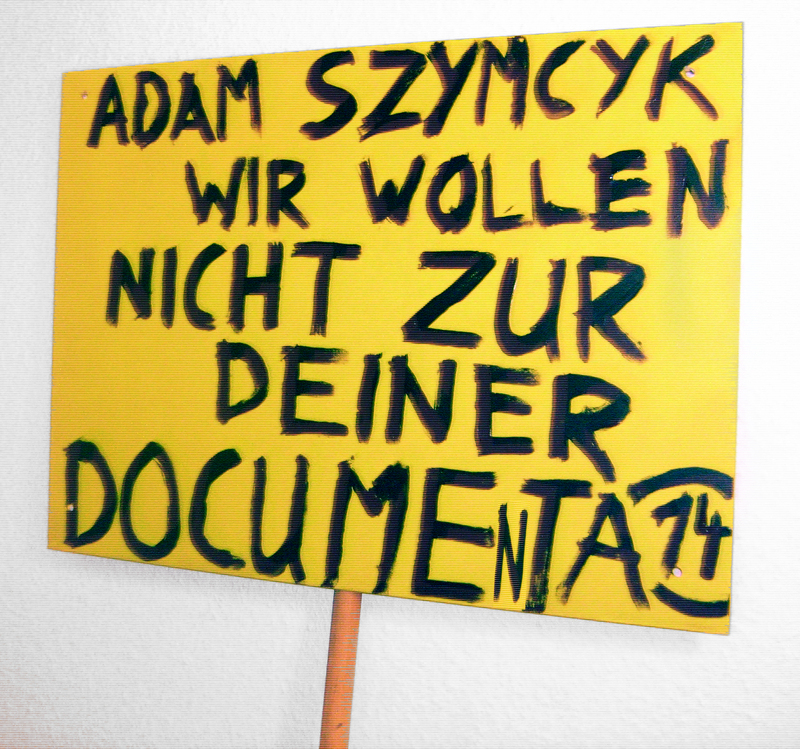 Adam Szymcyk hat nämlich wie viele andere versucht uns so hinzustellen, als wollten wir uns an die Documenta anbiedern. Wir kennen diesen billigen Trick natürlich, so seine Gegner für sich vereinnahmen zu wollen. Wir wissen es ist nicht vermeidbar, Teil von dem zu werden wogegen man ist. Doch das juckt uns nicht, es macht uns nur entschlossener. Es gibt ja keinen anderen Weg. Wie sollen die Leute sonst erfahren, dass man dagegen ist? Man muss es doch laut sagen, damit alle bescheid wissen! Und Adam sagen wir ja auch, er soll es nicht persönlich nehmen, schließlich geht es bei allem nicht so sehr um ihn, sondern um den Dinosaurier. Der Dino wird ihm und allen Künstlern seinen Stempel in den Lebenslauf stempeln und fertig. Aber wir finden den Dino schlimm, denn aus Sicht vom Dino sind sie alle komplett austauschbar. Ganz besonders Adam sollte das wissen und uns dankbar sein, dass wir ihn warnen. Wir gehen davon aus, dass er selbst die Documenta noch absagen wird, weil er das erkennt. Admittedly, we feel sorry for Adam. He has this giant, famous animal on his leash, and everyone wants to talk to him and persuade him to do something. Everyone wants to climb into his life for 100 days on the back of the dinosaurs. What a stress! So we actually initially thought we would just relieve Adam and tell him right from the outset that we do not want anything from him, that he does not need to bargain with us. You see, it actually started very harmless. At first, we were not so belligerent. But it was all taken more seriously than that. What can you do? Adam Szymcyk has namely portrayed us as many others sought, as if we wanted to curry favor with Documenta. Naturally, we know this cheap trick to monopolize your opponents. We know that is not avoidable. Still, that does not affect us. It only makes us more determined. There is no other way. How else would the people know that we are against it? We must say it loud so that everyone knows! And to Adam, we also say he should not take it personally. After all, it is not so much about him as about the Dinosaurs. The dinosaur will stamp his resumé and that of all the artists. But we think the Dinosaur is bad because, from the perspective of the Dinosaur, everyone is completely interchangeable. Especially, Adam should know that and thank us for warning him. We expect that he himself will cancel Documenta because he knows that. Ist Ihre Koalition gegen andere große Kunstausstellungen oder nur gegen die Documenta? Is your coalition against other large art exhibitions or only against Documenta? Bevor wir uns missverstehen: Wir sind gegen alles was zu groß ist. Das muss kein einzelner großer Dino sein, wie die Documenta. Das kann auch eine zu große Summe von Dinos sein. Nehmen Sie zum Beispiel die Flugsaurier. Für sich genommen sind die nicht so groß, aber der Himmel ist so voll von diesen Biestern, überall diese Biennalen, Triennalen, Quadriennalen, Festivals, Kulturveranstaltungen, Wettbewerbsausstellungen, Kunstvereine, Privatmuseen usw., die Sonne kommt kaum noch durch. Das Angebot ist so groß, die Künstler wissen gar nicht, wo sie sich zu erst bemühen sollen, um eine Absage zu bekommen. Oder einen Stempel. Dann die Tyrannosaurier! Wir haben vor kurzem noch überlegt, ob wir sie noch schnell gegen die Documenta eintauschen sollen. Larry Gagosian und sein Imperium, die Art Basel, die Armoryshow, eigentlich die ganze Liste… Und wissen Sie was? Sie wussten schon davon und haben uns gesagt, wenn wir öffentlich machen, dass wir nicht zu ihnen wollen, dann kommen sie in unsere Ateliers, nehmen uns unsere Werke und verkaufen sie! (lacht) Im Ernst, das klingt zwar erstmal nicht schlecht, aber es hätte den Grundgedanken, den wir hier vertreten sofort untergraben. Denn wie soll denn ein bloßer Gedanke verkäuflich sein? Der ist doch nicht dasselbe wie unsere Kunstwerke! Sie sehen das Problem. Etwas zum Werk zu machen und zu verkaufen das alle für eine antikapitalistische Moral halten, wirkt einfach ein bisschen zynisch. In so ein Fahrwasser wollen wir gar nicht erst geraten und da kommt uns die Documenta gerade recht. Sie ist ein Prachtexemplar mit einer gewissen Pflanzenfressermoral. In ihrem Magen befinden sich fast alle Probleme unserer Zeit. Ihre Gestalt repräsentiert für uns das umfassende Dinosauriertum. Und sie lebt sowieso schon in ständiger Bedrohung. Wenn wir sie angreifen, befreien wir uns von jeder Moral. Super! Was Besseres kann uns als Künstler gar nicht passieren. Before we are misunderstood: We are against all that is too big. That does not need to be a single large Dinosaur like Documenta. That can also be a sum total of Dinosaurs. Take, for instance, the pterodactyl. On their own, they are not so big, but the sky is so full of these beasts, of all the biennials, triennials, quadrennials, festivals, cultural events, competitive exhibitions, art clubs, and private museums that the sun barely comes through. The proposition is so large that artists do not know where they should aim only to get a rejection letter. Or a stamp of approval. Then there is the Tyrannosaurus! We have recently considered if we should quickly trade up from Documenta: Larry Gagosian and his empire, the Art Basel, Armory Show, actually the whole list. And you know what? They already knew this and have said, if we make it public that we do not want them, they will come to our studios, take our work, and sell it! (laughing) Seriously, that sounds not bad at first, but it would immediately undermine the basic idea we represent.Then how could a mere thought become marketable? That is still not the same as our artwork! You see the problem. To work to make something and to sell it all as anti-capitalist morals seems a little cynical. We do not want Documenta to just come in handy. She is a fine specimen with an herbivore’s morality. Almost all the problems of our time can be found in her stomach. For us, her figure represents the entire Dinosaur’s world. And she lives in constant threat. If we attack her, we rid ourself of all morality. Super! What better can happen to us as artists? Was ist die Funktion des zeitgenössischen Künstlers? Sollten sie nicht versuchen, ein Teil der großen Kunstausstellungen oder des großen Kunstbetriebes zu sein? What is the function of contemporary artists? Should they not seek to be a part of the large art exhibitions or large art world? Wir wissen, es ist absolut überflüssig Teil von etwas Großem sein zu wollen. Genauso wie eine Funktion haben zu wollen. Das ist auch nur so eine billige Art von Größe, gegen die wir vorgehen. Kunst hat nämlich keine definierbare Größe und erstrecht keine Funktion! Und wenn der Künstler eine Funktion hat – ich kann mich da nur wiederholen – dann ist es nur die eine: Dagegen sein! Wenn nötig, gegen alles. Je mehr man in den meisten Fällen dagegen ist, desto besser. Nicht nur gegen einen zu großen Betrieb, zu große Ausstellungen und jede Form von Vereinnahmung, auch gegen sich selbst zu sein ist wichtig! Jeder Künstler sollte das regelmäßig probieren, besonders wenn er sich für einen ganz großen hält. Wer sich und alles andere nicht mehr überwinden kann, beginnt Kunst zu machen, die langweilt! art exhibitions, and every form of usurpation, but it is also important to be against yourself! Every artist should try that on a regular basis, especially when he thinks he is really big. Anyone who can no longer overcome begins to make boring art! Wie sollen Künstler ihre Arbeit in der Öffentlichkeit präsentieren? How should artists present their work in the public? In der Öffentlichkeit? Am besten gar nicht. Denn die Öffentlichkeit, und damit meinen wir natürlich die breite, ist tot. Sorry, aber es sieht ganz danach aus. Wir sind nicht so dumm und erklären die Kunst für tot, sondern die Öffentlichkeit! Unsere Kunst lebt wie Sau, während die Öffentlichkeit Gott spielt, also tot ist. Doch es gibt immer einen Ausweg! Wer leben will, schließt sich uns an! Und das ist jetzt keine Werbung, denn wir missionieren hier nicht. Das ist so normal wie ein Apfel, der vom Baum fällt, wenn er reif ist. Stellen Sie sich Marie Antoinette vor, die war auch so ein Saurier. Sehen Sie? Es wird bald so ziemlich jeder – nicht nur wir – gegen alles sein, was zu groß ist. Man wird erkennen: auch das Große ist austauschbar. So austauschbar wie die großen Werbeplakate in der Öffentlichkeit werden bald auch die großen Ideen sein. Die großen Titel, die großen Imperative. Die Öffentlichkeit selbst wird verschwinden. Die Documenta und unsere Aktion werden in Zukunft nichts bedeuten. Die Bewegung ist einfach da, im Grunde auch ohne uns. Wir setzen nur eine Wegmarke. Und es wird übrigens die erste Bewegung weltweit sein, die keine Symbole mehr braucht. Sie wird überhaupt nicht den Charakter von Größe haben. Die Kunstwerke hingegen werden dort gezeigt werden, wo einzig die Künstler es für richtig halten . Die Kunst wird darüber lächeln wie die Mona Lisa. Die ja übrigens auch nicht groß ist. In public? At best, not at all. Indeed, the public, and by that we of course mean the general public, is dead. Sorry, but it looks to be that way. We are not so stupid to say art is dead. We say the public is dead! Our art lives like Hell while the public plays God as if he is dead. But there is always a way out! Whoever wants to live agrees with us! And that is not advertising because we are not on a mission here to convert anyone. That is so normal like an apple that falls from a tree when it is ripe. Imagine Marie Antoinette! She was also a dinosaur! Do you see? It will soon be pretty much everyone – not only us- against all that is too big. It will seen: even the great is replaceable. Soon the big ideas will will be as replaceable as the big advertising posters in the public, the major titles, the major imperatives. The public itself will disappear. Documenta and our actions will mean nothing in the future. The idea will be there, but without us. We only set a landmark. And it is, incidentally, the first worldwide movement that needs no more symbols. This movement will not have any image or character of greatness. The artwork will, however, be shown there and kept only in the way the artist sees fit. The art will smile like the Mona Lisa. She, by the way, is also not big. Please view WIR WOLLEN NICHT ZUR DOCUMENTA 14 online and “like” Critique Collective on Facebook at http://www.facebook.com/critiquecollective.